The sages have made significant improvements to your battles for Darkshine! It is now possible to manage your Items from one place! From now on, you can find all your Black Market Items in the My Items panel! A new purple button at the bottom left corner of your screen is your key to accessing this panel. Here you can also see which of your Items are currently activated and how much time remains before they expire. This way, you will be kept up to date on the current status of your Items and, if an Item is expiring, have the ability to quickly extend it or buy a new one. All this is possible without even leaving the My Items panel! If you prefer to manage your Items the old way, no problem - you can still find all of your Items in the Black Market. From here, you can also easily go to the My Items panel simply by clicking a second purple button, this one inside the Black Market. Take note: once you have activated an Item, it will appear next to the purple My Items button. Up to three Items can be simultaneously displayed there, along with their durations, and the third Item - if activated - will replace the purple button. In this case, you can access the My Items panel by clicking on any of these activation icons. This is not all - you can also manage your Paragon Status, Dragon Arts, and League Effects right from the My Items panel! 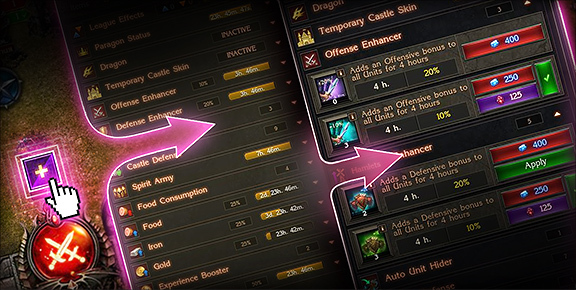 Strengthen your forces and get new Items to make your quest for control over Darkshine a success!